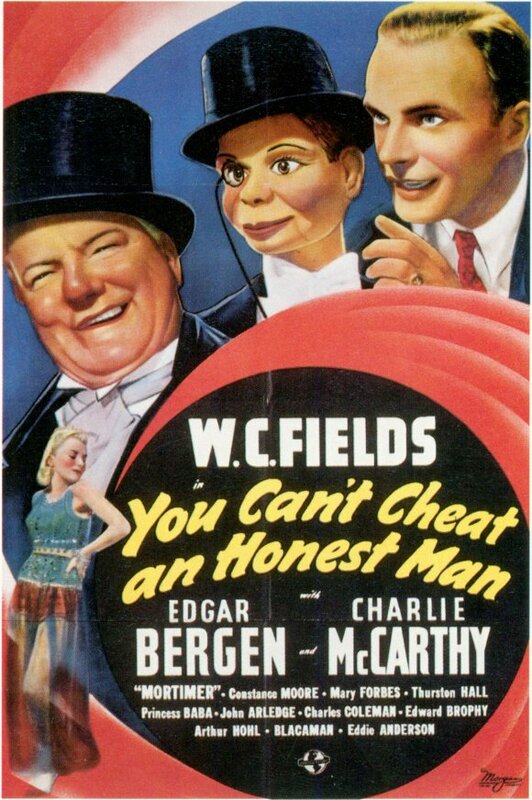 Larson E. Whipsnade (W.C. Fields) attempts to save his seedy circus from financial ruin while feuding with his ventriloquist employee (Edgar Bergen) and Bergen’s dummy (Charlie McCarthy). Viewed by most critics and fans as a “lesser” W.C. Fields comedy, You Can’t Cheat an Honest Man nonetheless remains a genuinely amusing film — indeed, my already substantial list of “redeeming moments” below could easily have been longer. And while I agree with Peary that far too much screen time is given to Bergen and McCarthy (who do slow down the proceedings quite a bit), I’ll admit I enjoyed getting to see this well-known duo on film at least once. In future viewings, I’ll simply cut straight to scenes with the infamously obnoxious Fields, who never fails to delight. Here I go again with my rant on what constitutes ‘comedy’. …Now that I’ve said that, I won’t rant (and belabor the obvious). Except to say that, to me, comedy can become dated – and this Fields flick has done just that. I see no element of surprise here and find the thing wearisome. However, in the film’s defense – and as the assessment indicates – when it comes to comedy, it’s also true that personal taste dictates what one finds amusing. Die-hard Fields fans may very well be delighted. I’m not an overwhelming Fields follower. I know I like him in a few films – this isn’t one of them. I did perk up slightly at the somewhat-inventive ping-pong sequence near the end. That aside, however, I pretty much couldn’t wait for this to be over. I would be curious to revisit this one and see how I react at this point; it’s now been five years since my review, and my attitude towards Fields has (strangely enough) shifted. What I once found delightful I now often find tiresome. What’s particularly odd to me is not all that many years have passed since the time his antics uniformly tickled me. Could it be simply that Peary includes SO MANY FIELDS titles in his book that I’ve become both inured and overwhelmed? Difficult question to answer. I’ve no idea. There can be so much to consider when we assess the work of directors/writers/performers. Sometimes we just click with a particular artist and are rarely disappointed by what that person creates. Sometimes we don’t particularly click with someone at all but we recognize when we can make an exception because the person has created or been part of a piece that resonates with us. And other times, no matter what, we just can’t appreciate a particular artist at all, no matter what he/she does. In posting, I feel my main obligation is to report what I think works or doesn’t. That decision will most often be subjective, though I try to recognize when I’m being much too subjective towards something that does have genuine merit but just ultimately doesn’t work for me personally. Fields is a good case in point. As I said, I’m not a big fan. However, I’ve seen him in a few things I’ve liked – but more than that, I’ve seen him when I feel he is at his best. So, in that case, or those cases, I’m not willing to settle for anything less from him, generally. That said, hundreds of comedies have been made to suit the masses – and we all know that the masses quite often demand a lot less from artists. In fact, such audiences can resent it if what they’re watching is in keeping with too high a standard. Artists often know that, and often make films that are way below their talents but make lots of money (look at Steve Martin).